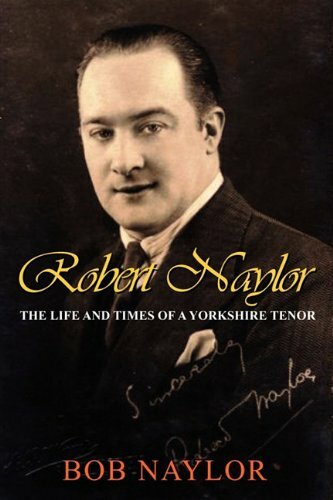 In 1922 Robert Naylor left his job in a Yorkshire woollen mill, went to London and became a star. He would go on to front productions with the Old Vic and the Carl Rosa Opera Company and make numerous radio broadcasts in the early years of the BBC, appearing in the West End and topping the bill at the Palladium. But his life-changin moment came when he was understudying for the famous Austrian tenor Richard Tauber in The Land of Smiles at Drury Lane. Tauber became indisposed on the third night of the show and Robert took over to huge professional and public acclaim. In the years since the second world war Robert Naylor's, like so many of the names to be found in this fascinating book, has been almost entirely forgotten. Yet in his day he brought pleasure to thousands via his stage appearances, radio broadcasts and records. This book is not just the biography of one man. It offers a rare insight into the growth of the music entertainment industry during the inter-war years and contains a wealth of information on its composers, lyricists, conductors and variety acts, and the world in which they lived. It will be of interest to anyone with a feel for social history, and to those who share the author's passion for the early days of popular music. It is the story of a long-vanished era. The author Bob Naylor was born in Bradford in 1949. He is an amateur musician and avid record collector with an interest in many different forms of music and an extensive knowledge of the history of the popular song. He has contributed articles to magazines and liner notes for record sleeves. Though not related to the subject, he became increasingly intrigued by his famous namesake. With little to go on, he has painstakingly put together the life and career of the man they called the 'English Tauber'.